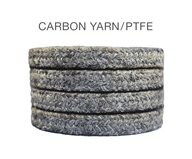 Teflon® impregnated, high strength, carbon yarn with break-in lubricant. Non-abrasive – saves shaft sleeves. High heat conductivity – longer life. Non-asbestos – reduces handling costs. Broad chemical compatibility – saves and reduces inventory and maintenance costs. Extreme corrosive service such as strong caustics, acids, pulp stock, and other slurries. Medium pressure valves and pumps. Mixers, autoclaves, and reactors (due to high resiliency of Thomson CHEM-3 packing).